This author’s first tube amp project is a new version of the Nardeux Stereomatic 302 S Amplifier. PHOTO 2: Author’s Nardeux Stereomatic 602 S amp. My idea was to build a tube amplifier similar to my recollections of the original Nardeux. The 302 S is a PA amplifier unit containing two power supplies and two monoblock amps using 807 pentodes, a preamp with push-switch type bass and treble controls, and two inputs—one for a Shure microphone for public address, and one for a cartridge pick-up for the Dual 1009 turntable with a Shure M3D stereo cartridge. It was a full-range system consisting of four speaker cabinets. The bass cabinet had an 18” bass speaker and two 7.5” paper cone tweeters. 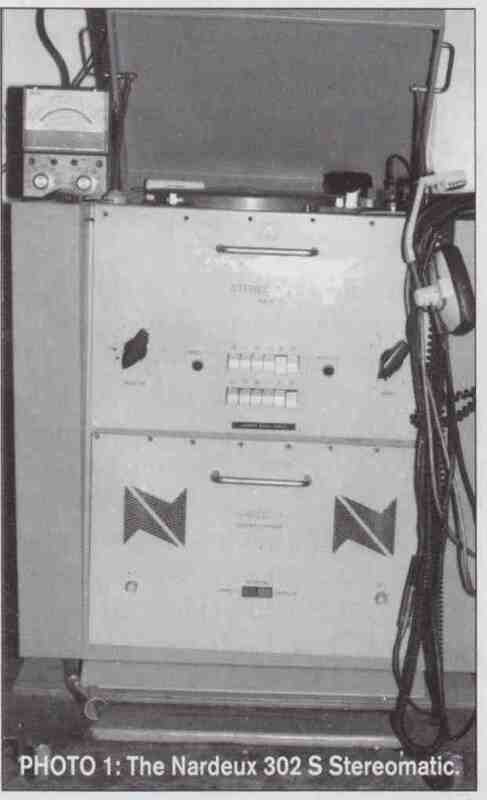 The midrange cabinet consisted of four 7.5” full-range speakers with whizzer cones and alnico magnets. This unit was original equipment from Loches, France, that was a part of the Himalaya amusement ride in Coney Island from about 1967 to 1975. Although I had no access to the Nardeux 302 S schematics, I remembered that each amp section power supply consisted of two 866A mercury rectifier tubes and the amplifier section used 807s in the output stage. After reading “A 211 SE Triode Amp”, I decided to contact Nick and ask him whether he would be willing to help me with a good design for my project. He said yes, and has been very pleasant and patient throughout. After numerous e-mails over a span of about one year, and many troubleshooting tests, I can finally say that I have an excellent and powerful amplifier (Photo 2). There is nothing more exciting than listening for the first time to your own first-built vacuum tube amplifier, in this case, the “Nardeux Stereomatic 602 S” (30W per channel x 2 channels in stereo). Considering I had very limited electronic test equipment available, I was able to work my way through troubleshooting and testing via the trial-and-error method for the most part. I had no audio generator or oscilloscope at the time to test properly the input and output section of the amplifier. Please keep in mind this was my first tube amplifier project, and I am writing this article from notes based on Nick’s help, my own trial-and-error testing, various articles I have read, Internet articles, and Beginner’s Guide to Tube Audio by Bruce Rozenbilt. I actually completed this project in 2002. The only change I needed to make was to remove two 807s from each channel. Instead of having the desired quad of 807s, I now have only two 807s per channel because it was the only way I could stabilize the amplifier. I was hoping to get about 60W per channel, but settled for about half of that. I believe the original Nardeux 302 S was rated for 100W per channel. I don’t have a way of measuring the out put power using just the two 807s. I would appreciate feedback on ideas for possible modifications or improvements. For example, improving parts such as the output transformer, or possibly modifying the circuitry so that a quad of 807s is stable, or using other tubes to output at least 60 to 100W per channel. This amplifier is based on the Williamson ultralinear push-pull parallel amplifier. Each channel uses two 6SN7s for input, phase splitter, and driver section, and two 807s in the amplifier output section. The power supply uses two 866As mercury vapor rectifier tubes for a frill-wave rectifier. I decided to build two separate dedicated power supplies on one chassis and two mono amplifiers for stereo on a separate chassis. This worked out nicely, but I encountered a lot of trouble stabilizing the amplifier, mostly when trying to use four 807s and the feedback loop resistor/capacitor values. The instabilities included pulsing DC, hum, and noise. By using a resistance decade box and a capacitance decade box, I was able to dial in different value resistors and capacitors simultaneously until the amplifier stabilized with little extraneous noise, hum, or power supply pulsing DC. I learned the hard way that I needed to use shielded cable from the input (from RCA jack input to input of V1 and shielded cable for the feedback loop itself. The shield being grounded on the input end only helps prevent ground loops. One modification I implemented was to connect a .001uF capacitor from feedback loop to ground to reduce feedback, which resulted in opening the amplifier with more gain and open-airy sound. Even after all this trial and error, troubleshooting took most of the time in order to get this amplifier stable. This amplifier now sounds very powerful and produces very satisfying music output. I’m sure this amp can probably be improved and tweaked even further with a sine- and square-wave generator using an oscilloscope to optimize the amplifier’s sonic characteristics and power output. PHOTO 4: Rear view of amp. If I had to build this amplifier again, I would build two separate monoblocks, each with its own power supply and amplifier on one chassis instead of the two chassis I used here. I did this because I wanted to basically build a layout similar to the original Nardeux 302 S. I would also use small diameter microphone-shielded cable for all audio signal paths, add volume controls for each channel, and use a choke in the power supply to reduce the high voltage hash that is slightly audible at the speakers. The AC power cables tightly twisted away from signal cables. 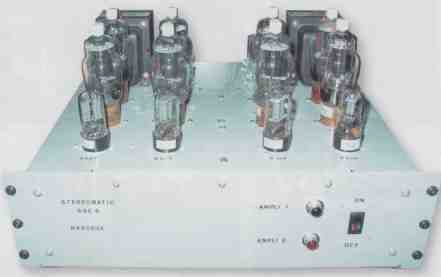 Matched tubes in the output section also may improve stability and pro vide equal power output in each output channel. 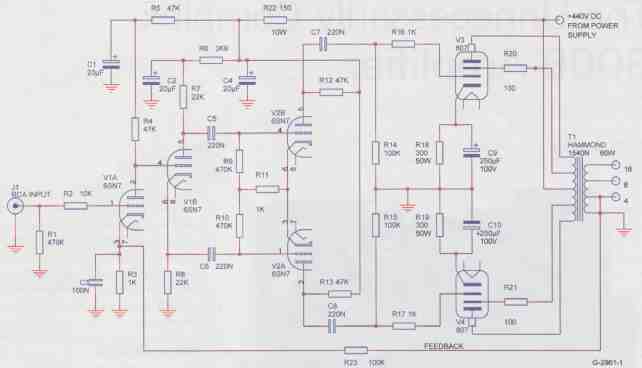 This schematic uses a fixed bias on the 807s. I chose to keep the integrity of the original Nardeux 302 S by using the 866As in the power supply. 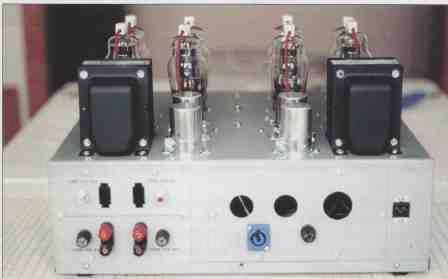 Any input from readers is most appreciated, since I plan to build another version of this amplifier in the future. This project also brings back fond memories of my brother Andrew Badalamenti, who also worked on the Rever chon Himalaya ride in Coney Island and worked the Nardeux Stereomatic 302 S PA music system and the ride during the summer months for many years. It was my brother who got me interested in the Nardeux system and stereo equipment. We both have great memories when we reminisce about the good old days testing, experimenting, and just enjoying classic stereo equipment such as the Nardeux. FIGURE 1: Power amp circuit (one channel). 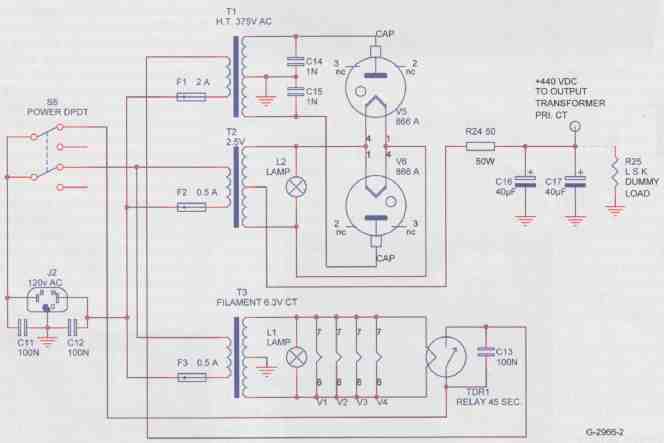 FIGURE 2: Power supply circuit (one channel).